As for acquiring capital–the most important types of capital don’t require much money. 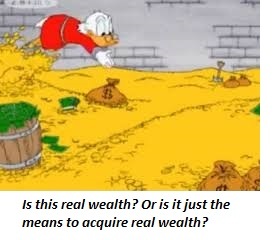 What is real wealth? Money, right? Currency, gold, quatloos, you name it. Money is real wealth because you can use it to buy whatever you want. I would argue money in any form is only the means to acquire real wealth, which is the agency, opportunity and time to pursue your life’s work. The conventional view that wealth is money and leisure has it all wrong. Let’s imagine the owner of a vault of conventional treasure: jewels, gold coins, etc. If the “wealth” stays in the vault, what’s the point of owning this “wealth”? The secret satisfaction of being “wealthy”? If “wealth” is only an internal state, then let’s measure friendship and being needed/wanted as the metrics of “wealth.” You see the point; if “wealth” is merely an internal state of satisfaction, then a vault full of “money” is a poor metric. What money buys that is real wealth is freedom and control of one’s life. This control over one’s life is called agency. Agency is defined as “the capacity of an actor to act in a given environment.” This may not seem like a profound concept, but another way to describe agency is that agency is the opposite of powerlessness. People with agency define themselves and their identity; they shape the world they inhabit rather than passively await whatever circumstances deliver up. In the real world, people with agency move on when things no longer work for them in a particular situation. Agency is not just the opposite of feeling powerless; it’s also the opposite of victimhood, i.e. the state of being in which others are held responsible for all of one’s travails and difficulties. Agency and responsibility are two sides of the same coin: each manifests the other. Opportunity is a form of wealth–and so is the wherewithal to take opportunities that arise. Though there is a random element to opportunity–i.e. getting lucky–the wherewithal to take the opportunity is not a matter of luck. It requires a specific appetite for risk, perseverance, the ability to discern how best to use the opportunity, and access to the capital required to exploit the opportunity. Capital is a type of wealth that isn’t limited to “money”: Character traits are capital, social networks are capital, experience is capital, knowledge is capital. All of these forms of capital are often more important than “money” capital. As for “money” buying leisure–leisure in abundance is a disaster for the vast majority of people. Humans are designed to be needed by others, to be part of something greater than themselves, and to gain dignity and pride by doing useful work–whether they are paid “money” for this work or not. This is why so many of those with the “money” to have endless leisure are miserable. Their lives are an endless treadmill of frivolous consumerism, neurotic pettiness, hypochondria, expressing their infinity of heartaches to counselors, and saddest of all, medications in abundance to relieve the ennui and the dead weight of their purposeless existence. “Money” is only useful if it is a means to acquire real wealth, which is the agency, opportunity and time to pursue your life’s work. There are many people who can spend $600,000 a year on various things (i.e. their “lifestyle”) who don’t feel “wealthy”–and if they don’t have agency and time for work that’s meaningful to them, they aren’t wealthy: they’re as impoverished as the person earning a fraction of their income. Real wealth doesn’t actually require a vast horde of “money.” It requires some money, but how much depends on the cost of agency, opportunity and time. For those with few needs and the right priorities, the cost of agency, opportunity and time needn’t be all that high. As for acquiring capital–the most important types of capital don’t require much money; determination, self-discipline, organization, a voracious appetite for knowledge and work, an insatiable curiosity, a generous heart, a knack for friendship, the purposeful pursuit of goals– these are the tools to acquiring real wealth: agency, opportunity and time to fulfill one’s life work. I explain how to amass the most empowering forms of capital in my book Get a Job, Build a Real Career and Defy a Bewildering Economy. Inequality is rising globally, and rising inequality is destabilizing. A status quo of increasing inequality self-destructs. To avoid this fate, we must answer this question: why is the gulf between the wealthy and everyone else widening so dramatically? The answer boils down to one word: privilege. What is privilege? There are many types of privilege, but they all share two characteristics: privilege delivers benefits, wealth and power that are unearned. 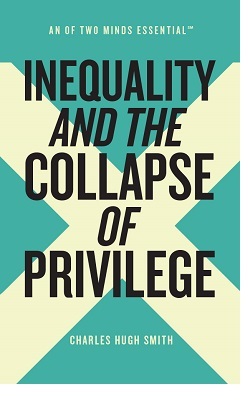 Privilege is destabilizing for many reasons: the dead weight of privilege reduces productivity, generates perverse incentives and fuels social injustice. Innovation and competition are threats to privileged monopolies and are therefore suppressed. The only way to foster sustainable stability is to dismantle institutionalized privilege. We have a moral imperative to eradicate privilege: privilege is immoral, as rising inequality is the only possible output of privilege. Privilege is exploitive, parasitic, predatory and destructive to the society and economy, and generates inequality by its very nature. Stripped to its essence, privilege is nothing but institutionalized racketeering. September 15, 2018 in Das KAPITAL.